Today I bring you a classic look but with a very trendy touch. It´s a two piece lace suit by Zaful in blue. This season the lace is going to raze, so I hope you like my proposal. The set consists of a pencil skirt and a cropped top of the same shade, a lovely blue and super flattering for both brunettes and blondes. To add a lady touch to the outfit, I have combined it with a classic Carolina Herrera handbag in beige and a classic Prada sunglasses. 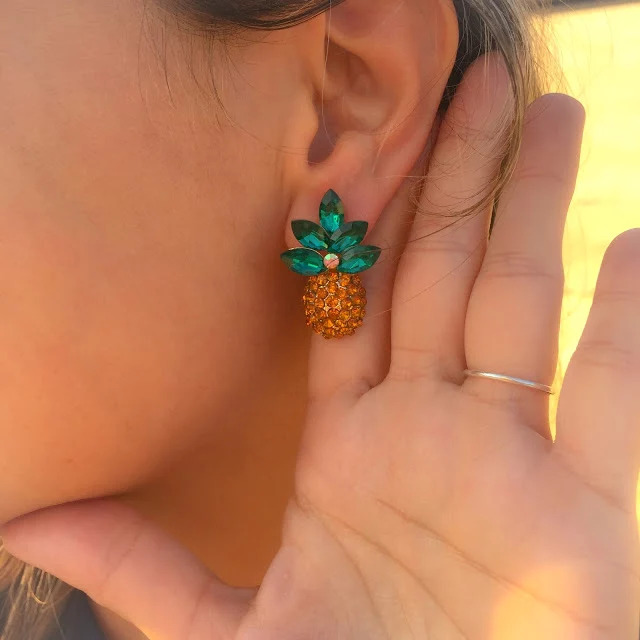 The fun point cames with the pineapple earrings, also by Zaful, and made of color crystallites (are great), with a bracelet of Didileta with marble effect and silver Uterque sandals. What do you think of the mix? I leave you with the photos and at the end you can find the links to buy everything I have. By the way, if you want to see my day-to-day looks and photos with beauty tips and many more things, I'm waiting for you on my Instagram profile. ¿Qué tal habéis empezado la semana? Parece que el otoño no se ha llevado todavía el calorcito, así que hay que aprovechar para ponerse los últimos outfits veraniegos antes de sacar los abrigos. Yo hoy os traigo este mini vestido de Zaful de flores en tonos beige y azules que he combinado con accesorios en tonos rojos. Siempre me ha gustado la mezcla de estos tres colores y la utilizo bastante en mis looks de día. Este vestido (LINK AQUÍ) me encanta porque tiene un montón de detalles. El escote en pico delantero está rematado con un adorno de hilo en beige. Además, cuenta con un lazo para ceñirlo en la cintura e incorpora la tendencia de mangas amplias que va a arrasar este otoño. Por detrás es una pasada, tiene la espalda descubierta y se sujeta con un cordón también en tonos beige. Para combinarlo he utilizado un shopper de Carolina Herrera clásico en tonos beige y rojos, con sandalias de Clarks a juego, de charol y madera, también rojas. Las gafas de sol son de Prada. Good morning, sweethearts!! !How did you started the week? It seems that autumn has not yet taken the heat, so you have to take advantage to put the last summer outfits before removing the coats.Today I bring you this mini dress of Zaful with flowers in beige and blue tones that I have combined with accessories in shades of red. I have always liked the mixture of these three colors and I use it quite a lot in my day looks. I love this dress (LINK HERE) because it has a lot of details. The front peak neckline is trimmed with a beige yarn trim. In addition, it has a tie to tighten at the waist and incorporates the trend of broad sleeves that will sweep this fall. 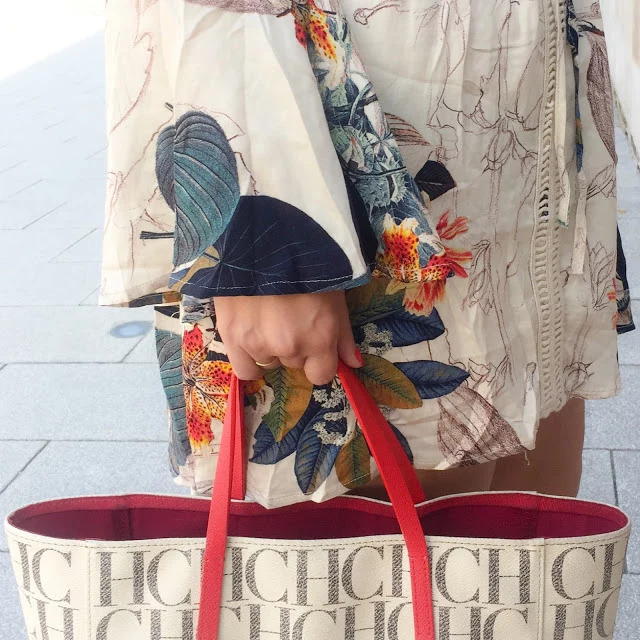 Behind it has the back uncovered and is fastened with a cord also in beige tones.To combine it I have used a classic Carolina Herrera shopper in beige and red tones, with matching Clarks sandals, patent leather and wood, also red. The sunglasses are from Prada.